U2 were joined by fan when they performed the rarely-played “In God’s Country” during their concert in Phoenix, Arizona on Friday. Rolling Stone reports the group was all set to play "The Sweetest Thing" on the B stage until Bono stopped them. "This guy I met earlier asked us to try 'In God's Country,'" he said. "Let's try a little of it." As The Edge worked out the chords of a tune he hadn't played in 14 years, Bono looked around the floor for the fan. "Are you the dude? "Do you know the chords?" The fan was brought onstage, outfitted with an acoustic guitar and – with some help from Bono – started the song that was last done a handful of times in 2001, but hasn't been part of the regular setlist since 1987’s Joshua Tree tour. 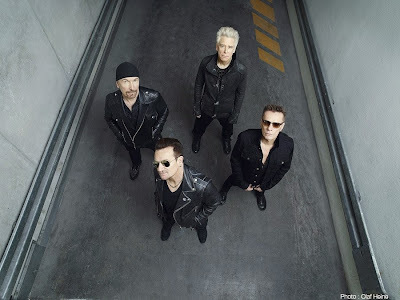 U2 recently launched their “Innocence + Experience” tour in Vancouver, with guitarist The Edge making headlines of his own when fell off stage during the show. The current North America leg wraps up in late July with an 8-show run at New York’s Madison Square Garden.